Evidenced by my recent onslaught of oven-heavy recipes, I realized that I may have turned a culinary corner. I shied away from baking for years, but lately, when I'm in the kitchen, it's for the sheer comfort and joy of it. This recipe was one such occasion. Lemon scented whipped-cream meets ripe raspberries and chocolate, cake-like cookies. It's an event as much as it is a dessert. 1) First, prepare the cakes. Preheat oven to 350. 2) Whisk together flour, cocoa, baking soda, and salt. 3) In another bowl, cream together butter and sugar. When light and fluffy, add in egg. 4) Mix in 1/2 of the flour mixture into the butter mixture. Add vanilla and buttermilk. 5) Combine in the rest of the flour mixture with the batter. 6) Measure out 1/4 cupfuls of batter onto two baking sheets, leaving about 2 inches around each cake. Bake for about 12 minutes, switching pan position after 6 minutes. Cakes are done when they spring back to touch. Be careful not to overbake or they'll dry out. Cool completely on baking sheets before assembling into whoopie pies. 7) While cakes are baking, prepare the filling. First, whip cream into soft peaks, then gently stir in sugar, lemon zest, and vanilla. Refrigerate until ready to assemble whoopie pies. 8) Assemble whoopie pies just before serving. Mound about 2 tablespoons of prepared cream filling onto the bottom half of a cake. Then place about 5 raspberries onto cream, and top with another cake, bottom down. There will be extra cream-- feel free to serve with another dollop on the side, if eating on a plate. These look insane! Perfect summer dessert. Oh my goodness, you have got to be kidding me, these look insanely yummy!! This looks seriously divine! 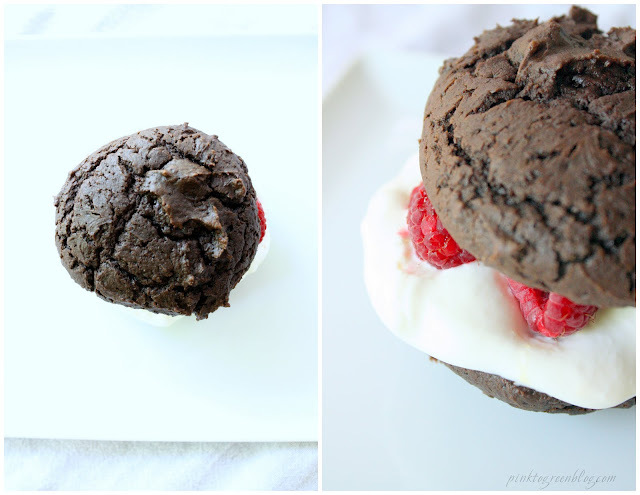 I was wondering why I've been craving a whoopie pie!